James Comey says US president treats women like ‘meat’ and there is ‘certainly some evidence of obstruction of justice’. Former FBI Director James Comey has accused US President Donald Trump of being “morally unfit” for the presidency and treating women like “pieces of meat” in his first television interview since being fired last year. Speaking to ABC’s 20/20 programme, Comey said: “The challenge of this president is that he will stain everyone around him”. The television interview on Sunday comes ahead of the release of Comey’s book, A Higher Loyalty, on Tuesday. According to the transcript of the four-hour interview with ABC’s George Stephanopoulos, Comey said he does not think Trump is “medically unfit to be president”, but rather “morally unfit to be president”. The former FBI director was referring to last August’s “Unite the Right” rally that turned deadly when a white supremacist allegedly rammed his car into a group of anti-racist protesters, killing 32-year-old Heather Heyer. Trump blamed “both sides” for the violence. Comey has been embroiled in controversy since reopening an investigation into whether Hillary Clinton’s use of a private email server while US secretary of state during Barack Obama’s first term as president compromised national security. Clinton said the release of a letter stating the FBI had uncovered new emails just days before the elections helped hand the election to Trump. 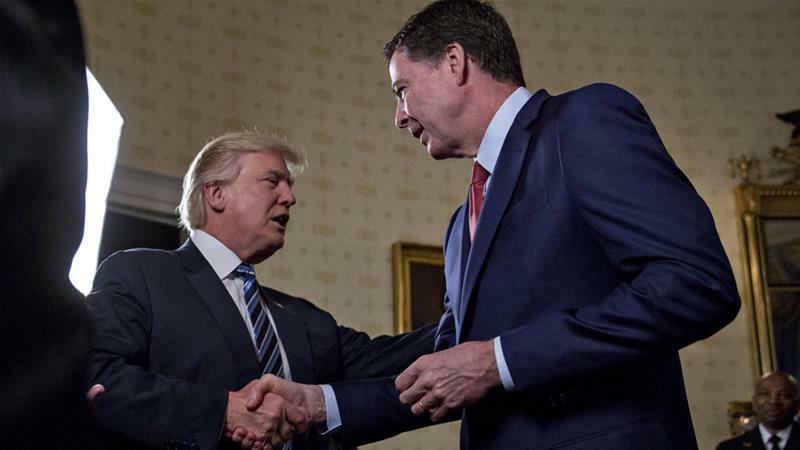 Once Trump took office, the president and Comey feuded over the FBI’s investigation into allegations of Russian meddling in the 2016 US presidential election and possible collusion with the Trump campaign. Comey said there is “certainly some evidence” when asked whether the US president committed obstruction of justice when Trump allegedly asked top aides to leave the Oval Office to privately ask Comey to drop his investigation into then-National Security Adviser Michael Flynn. Flynn was fired from his post last year. Comey added that the prosecutor would need to evaluate if “other things reflected on [Trump’s] intent”. Comey said he does not hope for Trump’s impeachment because “impeaching and removing Donald Trump from office would let the American people off the hook and have something happen indirectly that I believe they’re duty bound to do directly”. Comey repeatedly pointed to how he feels like the president does not value the truth and how he has lied to the American people. “There’s something more important than that should unite all of us, and that is our president must embody respect and adhere to the values that are at the core of this country,” Comey said. Prior to Sunday’s interview, Trump took to Twitter, calling the former FBI director “not smart” and saying he “will go down as the WORST FBI Director in history”. The White House has not commented on the interview, but the Republican National Committee did respond on Twitter saying Comey “isn’t credible”. What else did Comey say? “One of the many great things about the FBI is we have some hilarious pranksters in that organisation, and so I thought it was a scam by someone on my staff. So I turn to them and I said, ‘Someone put a lotta work into that.’ And then I continued talking.